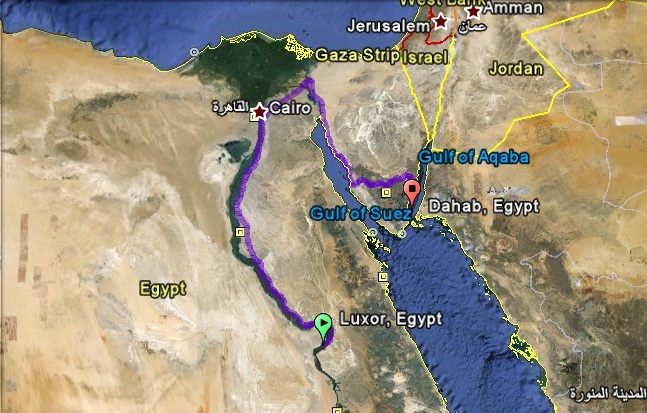 Luxor to Dahab: 1295 Kilometers. 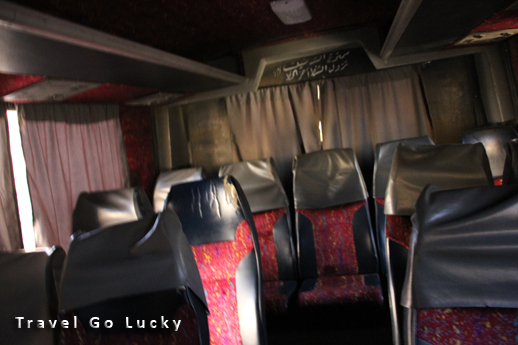 At the last minute, we decided to cut our time in Luxor short by one whole day in order to get to Sinai Peninsula coastal city of Dahab. Our mode of transportation? A twenty-one hour overnight bus ride. When Dana and I climbed into heap of metal that looked like a used 1980’s minor league baseball team bus, we knew we were in for a real treat. The interior smelled like stale cigarettes and everything was covered in a fine coating of dust. I won’t spare you the suspense: it was every bit as terrible as it sounds. The only silver lining was meeting a really nice couple from Ecuador, Jorge and Carla. We talked to them about our respective travels for hours before it was time to pass out. Note the luxuriously upholstered seating. After a sporadic four to six hours of sleep, we were awake again. At this point, our feet have swollen up so we look like the people from the future in the movie WALL-E, we are hungry, and we really want to get off of this damn bus. 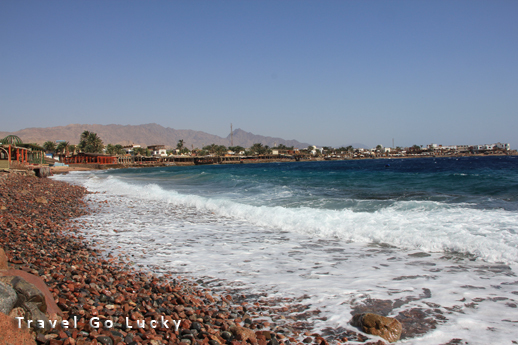 We finally arrive in Dahab and decide to tag along with Jorge and Carla to find a place to stay for the next two days. I was in no condition to be haggling with hotel owners, so Dana and I have to give our new Ecuadorean friends a lot of credit for their amazing negotiating skills. We ended up staying at a hotel with air conditioning and a pool for $12 total. That’s definitely the best deal we’ve had on the entire trip so far. Dana and Carla smiling at their $12 swimming pool. The next day we went snorkeling in the Red Sea, which was great and disappointing all at the same time. The fish we saw were beautiful, the water was crystal clear, but the coral in this area was in really bad condition, mainly from too many tourists touching and/or breaking it. While we know every place we visit won’t be some untouched paradise that has never been seen before, it is disheartening to see tourist areas with highly visible damage from too many visitors. Dahab is an interesting little town off the coast with a very laid back vibe—even the shops wouldn’t hound you to buy something quite as bad as the other areas of Egypt. There were European tourists everywhere in town, as this is one of the nearest “beach-type” destinations for them. It felt good to be in such a relaxed atmosphere, especially after our frenetic pace of seeing all the different historical sites in the rest of Egypt. The decor for all of the seaside restaurants were colorful and very relaxing. 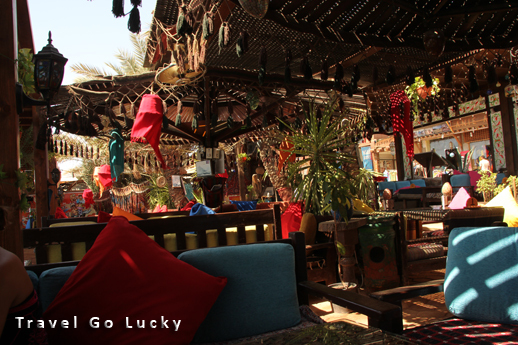 FUN FACT: Dahab is a copyright infringer’s paradise. 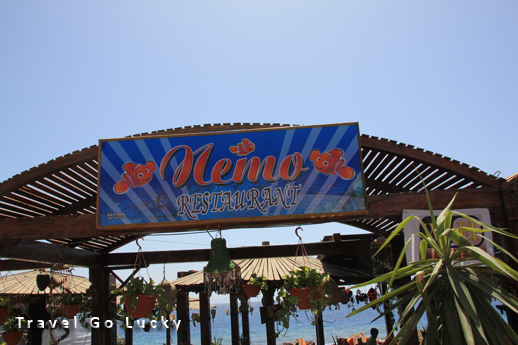 The “Nemo” sign below was one of a dozen different places named after some sort of American cartoon. “The Little Mermaid” and “Sponge Bob” cafes were also some of the other better known icons used as storefronts for unimaginative Egyptian restaurant owners. PUN INTENDED ALERT: I bet Pixar and Disney would find this sign rather fishy.